I've tried not to talk about B****t during the last few months. This is partly because there is nothing that I could say that would have any effect on the matter (no change there), scripted as it all seems to be by the ghosts of the writers of On The Buses, Till Death Us Do Part and The Benny Hill Show; and partly because - as I've said before - there's a certain grisly pleasure to be taken from watching the whole thing deliquesce into a pool of fœtid tripe. I mean, where the hell do you start with it? "It [i.e., the EU] has no intention of a deal..."
Yes, it does. Otherwise it wouldn't bother talking to your clapped-out country in the first place. But that doesn't mean that it will do any deal at any price. "...and is set on punishment." I thought that you English were quite keen on punishment? I mean, isn't that one of the main reasons why your governing élites have always been drawn predominantly from schools where Pure and Applied Sado-masochism are features of the curriculum? "That's the brief given to Michel Barnier, and he has been ruthless and unswerving." Barnier is the lead negotiator for the EU. That means that he is duty-bound to do what he perceives as being in the best interests of the EU. And the negotiating position of the EU was agreed in a matter of minutes by the other twenty-seven member states within hours of the Queen of Mayhem sending her arsenic-laced billet-doux to the Commission. We are still waiting for the government of Greater England to come up with any coherent negotiating position at all, apart from indulging in regular toddler's strops. 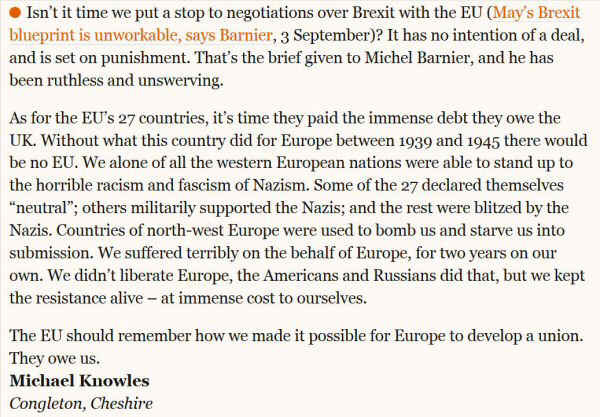 "...it's time they paid the immense debt they owe the UK"
They have. They've repaid it by having to put up with your constant carping, your rank obstructionism, your sub-Kipper prejudices and your insufferable arrogance for forty-five years without kicking your sorry ragged arses out. "Without what this country did for Europe [...] there would be no EU"
And we'd all be speaking German. Look, John, what did your country do for Europe in the years leading up to 1939? Well, firstly, it insisted on a 'peace' settlement at Versailles which was designed totally to humiliate Germany ("We should squeeze the Kaiser until the pips squeak! "); you then sat back and watched as the extreme right took advantage of national resentment and destitution, which was alright by you because as least they weren't demnation Reds; then you looked on with no concern at all as signifcant proportions of the German population were imprisoned or unpersonned - after all, they were only Commehs, Gyppoes and Red Sea Pedestrians, weren't they? And you capped it all by not only acquiescing to the annexation of Austria but actually conniving with Hitler at the dismemberment of Czechoslovakia. "We alone [...] were able to stand up to the horrible racism [...] of Nazism"
Ask the Jews of Whitechapel how you stood up to it. Better still, ask the peoples you ruled over in Indiah how committed you were to not beating them into submission or starving them to death because they were only 'wogs'. For - from all that we know of the proclivities and prejudices of your ruling élites in the 1930s - if the Wehrmacht and the Luftwaffe had actually fulfilled their task and invaded, three-quarters of what passed for your intelligentsia and ninety-odd per cent of your governing classes would have openly and nakedly collaborated with them, using the same excuse given by their Dutch, Belgian, Danish and Norwegian equivalents, viz. that they were "protecting the people from the worst excesses of the Occupation", notwithstanding the fact that by 1944 there wouldn't have been a single Jew left alive in Britain (note to Jonathan Sacks: that's what a real existential threat to British Jews looks like, you momser). Besides which, the only - but the only - reason your tight little, white little island wasn't itself invaded had nothing to do with some sort of innate moral superiority; it was down to the fact that there was a thirty-two-mile wide stretch of water between them and you. You had your tushes kicked off the mainland in 1940, and you didn't manage to get back there again until others came - however belatedly - to your assistance. "Some of the 27 declared themselves 'neutral'..."
Apart from the sneer implied in those scare quotes, those who declared themselves 'neutral' (oh bugger, I've done it now!) did so for understandable reasons. Like the Irish. Y'know, John, the Irish you'd starved and gunned down during much of the preceding century? ...others militarily supported the Nazis..."
Yes, like Spain, Portugal and Italy, which were already Fascist avant le lettre, and with whom your governments and corporations had had very cordial mutual relations throughout. "...and the rest were blitzed by the Nazis." When they weren't being strafed by you, of course. "Countries of north-west Europe were used to bomb us..."
And that's the fault of the people living there rather than those occupying their countries? "We suffered terribly on the behalf of Europe..."
But you weren't actually invaded or occupied, were you? So your suffering, as irksome as it undoubtedly was, was a long way down the scale from the indignities and destruction visited upon the French, the Dutch, the Belgians, the Danes and the Norwegians, let alone on the peoples of central and southern Europe. Don't try to come the Scouser ("We always 'ave it 'aaarder than anyone else"!) with us, sunshine. "We didn't liberate Europe, the Americans and Russians did that..."
How very generous of you to concede that - contrary to all those wonderful films of the fifties and beyond - The Wo-wah wasn't won by dear Dickie Attenborough and darling Johnny Mills on the back lot at Shepperton. You might also have mentioned the Free French, the Dutch, Belgian, Danish and Norwegian resistance movements and the Poles, Czechs, Slovaks, Indians and Africans who fought in your military. Now, all of the foregoing may seem rather a lot to hang on one silly letter, and it's possible that Mr Knowles is not as ignorant as he seems, but what his missive displays is by no means uncommon in a society which has - on the subject of The Wo-Wah amongst other matters - come to believe its own mythology. Indeed, the levels of exceptionalism can often reach near-American proportions, and they can appear at almost any part of the political spectrum. Because what I haven't told you - but what the more widely-read of you will already have sussed - is that Mr Knowles' letter appeared on the website of what prides itself (in increasing contraindication to the evidence) as being England's leading 'liberal' rag, namely the Grundiad. Now, I am well aware that one cannot always judge the political position of someone on the basis of the newspapers they read (see the fourth paragraph here for what I mean), but that such footling rah-rah can infest the readers of a supposedly 'progressive' newspaper, and lead them to insist that their entire society commits an act of self-immolation in its name gives one some idea of how deep the indoctrination has gone. And thus we find ourselves where we are today. Update (10/09/18): Isn't it nice to see my loyal followers piling in to make my points for me in the same paper?